The LOWEdown | The Official Blog of Casey Lowe. : Tow Mater Soup, Anyone? ...a man dream, can't he? All done digitally. The background is a repurposed image of Mater and McQueen on the railroad tracks that I had to do some fun "Clone Stamp Tooling" to. 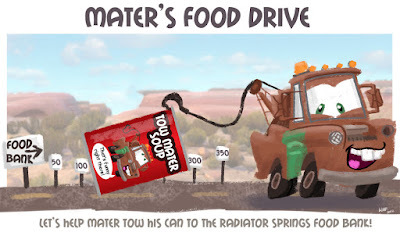 For the actual, printed version, I made the soup can a separate element and Mater's tow cable is made of brown packaging tape. The cable can be reeled in as cans are collected!